The sperm whale (Physeter macrocephalus) has a huge, square head which is 1/3 to 1/4 of the total body length (enclosing the large brain, spermaceti organ and associated structures; the spermaceti organ contains oil-like wax for which the sperm whale was highly valued and relentlessly hunted). Colouration is dark grey to brown in colour, although calves are lighter in colour than adults. The belly and front of the head may be whitish to grey and there may be white patches in the genital region and sometimes elsewhere on the body. A single blowhole is located on a slightly raised lump on the front left side of the rostrum. The lower jaw is underslung and extremely long and narrow, and contains 17 to 29 pairs of mandibular teeth measuring up to 25 cm long in very old males. When the mouth is closed the teeth fit into circular depressions in the palate of the upper jaw in which vestigial teeth are found at the apex of these depressions. The lips and lower jaw are white. The sperm whale has an extensive distribution world-wide. It may be found throughout all deep oceans of the world, from the equator to the edge of the polar pack ice. Whales usually live offshore, but may occur close to coasts where water depths exceed 200 m, for example off volcanic and oceanic islands. They are most common in submarine canyons at the edges of the continental shelf, but also occur in mid-ocean. Sperm whales are known to undertake extensive north-south seasonal movement in both hemispheres. Documented movements by individuals have been reported, for example, between Nova Scotia and Spain, and the Azores and Denmark. There is also some longitudinal movement across ocean basins. However, some populations of sperm whales appear to be resident in particular areas year round. Male sperm whales seem to travel more widely than females, probably only males making a large-scale migration. Females carry out less extensive latitudinal movements and remain mainly in tropical and temperate waters. Regardless, migrations seem to vary seasonally and between individuals, unlike the migrations of many baleen whales which have fairly constant and predictable migration habits. The sperm whale is the largest whale of the odontocete family; males grow to over 18 m (and can weigh up to 57 tonnes) and females to 12.3 m (and about 25 tonnes in weight). They are highly sexually dimorphic. A physically mature male is almost one and a half times as long as a mature female. Female sperm whales attain sexual maturity at an age of 7 to 13 years and a length of 8.3 to 9.2 m. Male sperm whales grow slightly faster than females until puberty, at an age of 7 to 10 years, when they are 8.7 m to 10.3 m long. Sexual maturity is reached at an age of 18 to 21 years and 11 to 12 m length. Sperm whales are seasonal breeders, but the mating season is prolonged, extending from late winter through to early summer. In the Northern Hemisphere, conceptions may occur from January to August, peaking in April and May. In the Southern Hemisphere, conceptions occur from July to March, peaking in September and December. Calves may be born in tropical and temperate waters and are mainly born in summer and autumn. The gestation period is thought to be 14.5 to 16.5 months and lactation extends for at least 18 months. Calves begin taking solid food before they are one year old, although some whales may continue to suckle sporadically for as long as 13 years. The sperm whale feeds primarily upon large mesopelagic squid, but also various types of fish. Their food preferences vary considerably with geographic area. In some regions, they eat almost entirely squid and in others, such as Iceland, fish are the principal source of food. The largest mesopelagic species of prey squid may have mantle lengths exceeding 1 m, but much of the sperm whales diet consists of medium-sized species with mantle lengths of 20 cm to 1 m. Other cephalopods may be eaten by sperm whales, including the mesopelagic vampire squid and benthic octopuses. Crustaceans are also very occasionally eaten, including the giant mysid Gnathophausia and benthic crabs. Several theories as to how sperm whales hunt have been proposed, including: the use of echolocation to scan for prey; the detection (in the dark) of squid by their luminous organs; random searching for prey by sperm whales swimming with their mouths open (suggested following the discovery of the sperm whale with its lower jaw entangled in a deep sea cable); and, the use of the whales white lips to attract prey into the open mouth. Sperm whales are known to co-ordinate their foraging dives, and they sometimes forage in a rank, often over 500 m long, with whales spread out underwater. They seem to feed regularly year round. 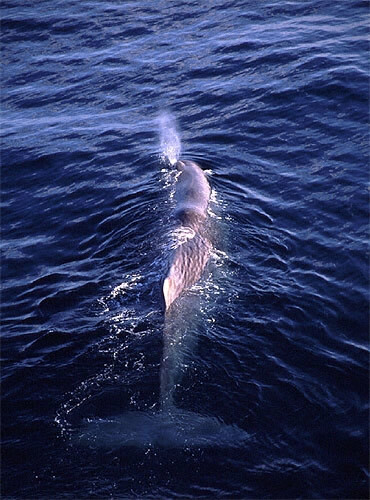 Sperm whales, like other toothed whales, are gregarious and live in groups of up to 50 individuals, although male sperm whales are sometimes solitary in high latitudes (above 40 degrees). The social structure of sperm whales involves seasonal and geographical segregation of the populations by age, social and sexual state. Several types of schools can be recognised: matriarchal nursery schools; juvenile schools; bachelor schools; bull schools and lone bulls. Large, mature males search for mates, associating for brief periods with the nursery schools of adult females and their offspring (found in lower latitudes all year round) during the breeding season. Sexually mature males may leave their natal pod to form loose bachelor herds until they attain social maturity and can compete for access to females. Large bachelors migrate seasonally to higher latitudes, probably because of better feeding conditions which also results in reduced competition for food. Nursery schools are socially very tightly bonded, with individuals remaining in the same school for many years. On average, 10 to 30 mature females and their offspring are found within a group, although mixed groups are normally spread out over large areas. Within groups, there may be communal caring for calves; indeed female sperm whales are known to display considerable altruism towards other group members if injured. Calves are attended by several different adults who may perform a baby-sitting role while the mother and other adults are foraging. Young males may also be involved in calf caring.